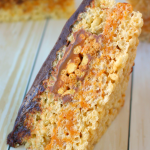 Caramel and chocolate come together to make one incredibly delicious treat! 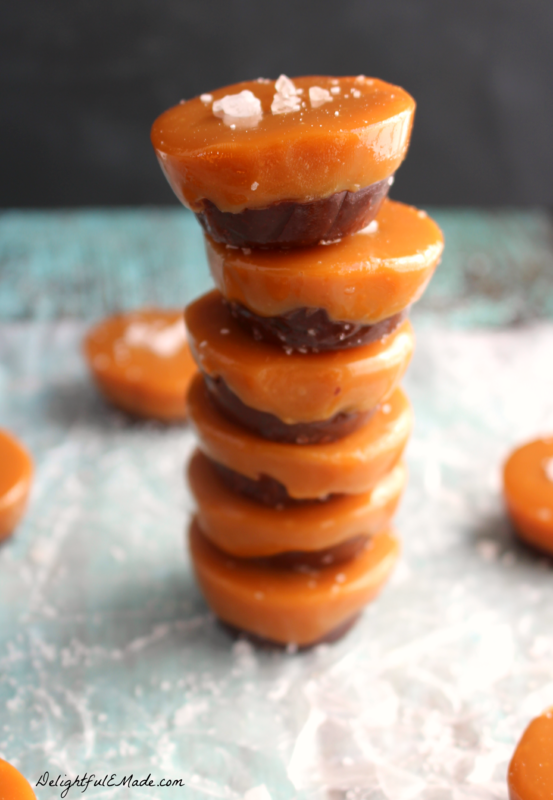 With just four ingredients, these Salted Caramel Fudge cups are soft, gooey, sweet and really easy to make! If you don’t already know, I’m a lover of salty-sweet treats. I also adore caramel and chocolate – specifically, dark chocolate. 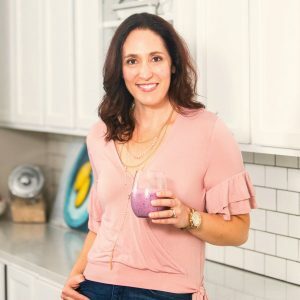 With this in mind, I’m always looking for delicious, easy ways to bring these together in one ultra-delicious bite of goodness. 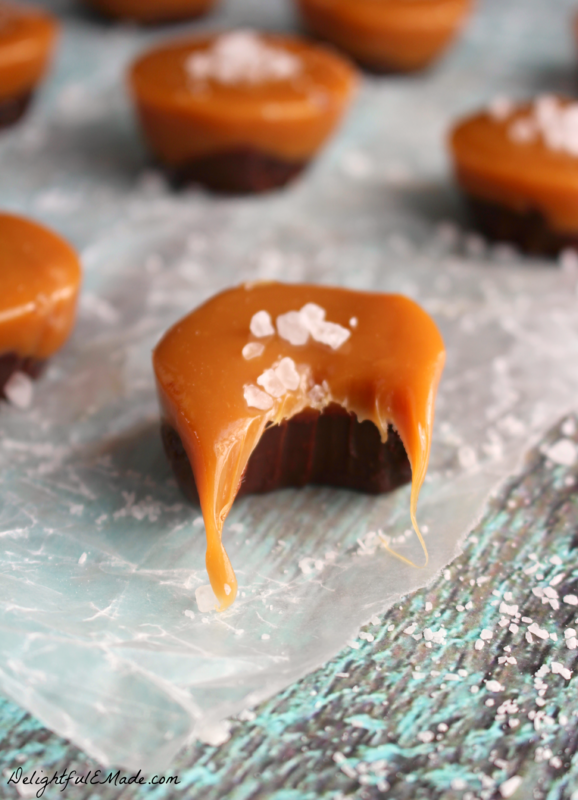 That’s how these Salted Caramel Fudge Cups came to be. 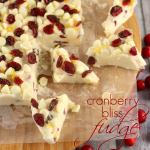 For me, when making candies and fudge, especially during the holidays, they have to be easy to make. I’m not really willing to mess around with candy thermometers, and multiple steps for tempering chocolate. Luckily, I’ve created a candy that is super-easy to make, and only requires FOUR ingredients. Yes, that’s right, only four! You’ll start by spraying a mini-muffin tin with non-stick cooking spray. You can also line the tin with mini-muffin liners. 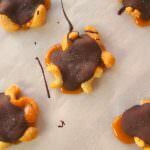 I would definitely recommend the liners if you’re making these candies for dessert trays, or holiday gifts. Once these candies set out at room temperature for a while, they being to soften and lose their shape a bit. There are beautiful mini liners out there – I found some at Michael’s Craft store for under $2 for a 50 count set. With non-stick cooking spray, generously spray a mini-muffin tin. Or place mini-muffin liners in each cup. (Liners are recommended if these candies will be at room temperature on dessert trays or for holiday gifts or treats, as they will help the caramels hold their shape.) You'll be preparing approximately 18-20 cups. Set aside. Add the chocolate chips to a bowl. In a small sauce pan, bring the heavy cream to a low simmer. Remove from heat right away and pour the hot cream over the chocolate chips. Stir continually until all the chocolate and cream has combine and the chocolate is completely melted. Add a heaping teaspoon to each of the muffin cups, filling each cup about half way. Put the pan in the refrigerator to cool. While cooling, melt the caramels. In a microwave safe bowl, unwrap all the caramels and add about 1 Tbsp. of water to help the melting process. Heat the caramels for 1 minute at 50% powder. Stir and heat again for 1 minute at 50% power. Stir again. Repeat the process until the caramel is completely melted. Take the chocolate out of the fridge. While the caramel is still hot begin adding a heaping teaspoon full of caramel to each fudge cup. It should fill the cup to the top. Work quickly as the caramel will cool and become stiff. 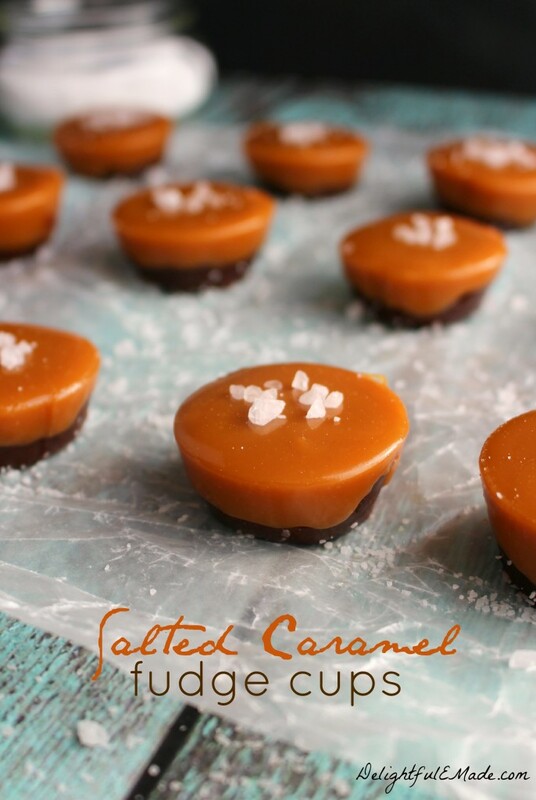 While the caramel is still warm, add a sprinkle of salt flakes/granules to each caramel cup. Refrigerate and let come to room temperature just before serving. 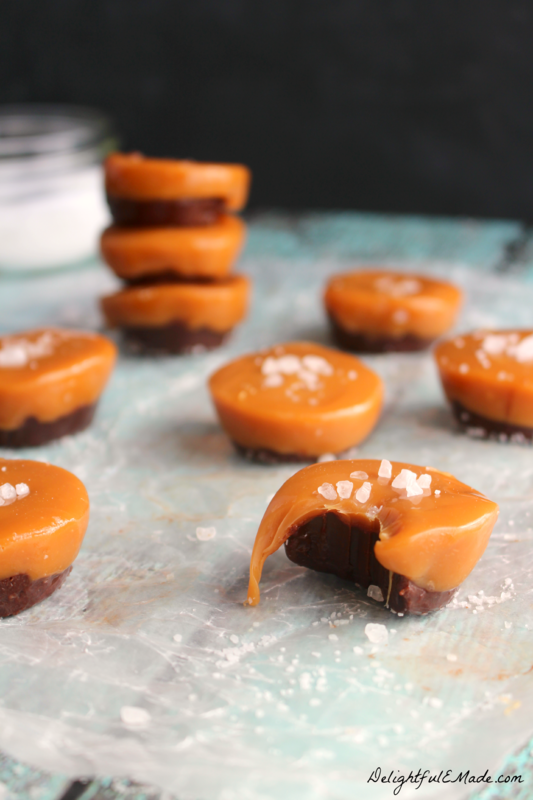 These Salted Caramel Fudge Cups are really easy to make. 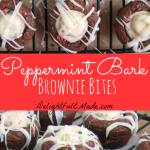 They’re wonderful for the holidays, and the perfect addition to any Cookie & Candy tray, great for holiday parties, and a wonderful treat to give to friends and neighbors. These would also be fantastic with a cup of hot chocolate on a cold night! Any way you enjoy these candies, they’re sure to satisfy the most fierce sweet tooth. I know first hand! They look delicious! I think I'm going to try these for the holiday! These are dangerous! 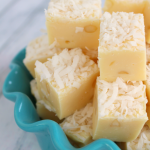 Way too easy to make, and way to yummy! I love salty- sweet, too! These looks so yummy and are so CUTE!! Perfect for holiday gift giving!! Nothing beats the sweet and salty combo! Love these cups! Happy Thanksgiving! I love that this is only 4 ingredients and thanks for the tip that these do better in mini cupcake liners since they will soften up. Presentation can make such a difference as to whether you can make, create and present it or end up eating the batch yourself! I know, right! Just four ingredients makes these really easy - and quite honestly, quicker to eat, too! ;) Enjoy! These look amazing! I was wondering if it would work the same if I made the caramel myself. Thanks! These are delicious, but I did not have luck with the mini muffin pans. I was on-board with the liner idea... But mid-way through making them, I wondered "how do you get caramels unstuck from these liners?" The answer is, you don't. I ended up freezing them, then soaking the liners in water to get them off. I then wrapped each one in wax paper. They are truly yummy, but sticky/melty at room temp. 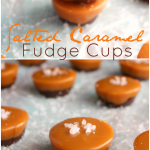 I made these tonight and the carmel got do hard. Any tips on how to change that next time? Thanks! Hi I made these yesterday and you are right they are quick and easy and I think they look like expensive boutique treats. My husband the foodie really like the combination of dark chocolate fudge and caramel with a smidge of salt. the only problem I have is that I used the mini cupcake liners and the caramel totally stuck to the liners so I had to scrape out the candy to give him a taste. Do you have any suggestions for alternative liners to allow the candy to release? I was thinking about trying a second batch and buttering the liners before I put the fudge/caramel in. Anybody have any thoughts or experience with this? Thanks! Hi Beth - so sorry these got so sticky in the liners. I'm in the process of testing some new methods for these to be less sticky. In the mean time, yes, I would recommend spraying or buttering the liners, or using foil liners that can be easily torn off. I hope to update this recipe soon. Thanks Beth! I used the mini cupcake cups since I was giving them as gifts and they STUCK! They look good in the box, but when you go to eat them... yikes! I wouldn't recommend it. 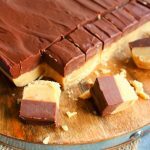 This recipe looks incredible!! I love all of the ingredients and must make them this week. Found you via Pinterest. Thank you! Hi Dana! So glad you stopped by - enjoy the caramels! I'd like to use the liners but I'm afraid the paper will stick to the caramel when it softens and tear off when the liner is removed. Have you tried the liners? I'm hoping to make these tomorrow! My back up plan is make the candy and then add to liner once set! I used paper liners (without spraying my mini muffin tin) and they peeled off just fine. Only had one of the 18 stick and tear. I chilled the fudge part for about a half hour before adding the caramel and then chilled them overnight to fully set. Delicious! Awesome!! So glad this method worked for you, Katrina! Thanks so much, for sharing. Happy New Year! Woops... I just saw the other comment!!! I think I'm going with my plan B adding the candy to liners once set! Hi there Samme. Yes, I would recommend this. When I originally made these, I sprayed the mini muffin tins really well with non-stick spray. After making I refrigerated. This helped them hold their shape well. With the help of the non-stick spray, I ran a knife around the edges and they slid right out. Adding to the candy liners once set is a good plan. You could also do some waxed paper squares, which would actually look really pretty, too! Enjoy! I made these exactly like the recipe said the first time...they stuck and were a mess...tasted delish, but messy! So the second time I used a bit less cream in the chocolate and added 2 tablespoons of cream to the caramel to make them a bit softer than the first batch. I put them in a pan and cut them instead - much easier to work with and not so "melty" at room temp!! Good to know they worked well in a pan. Thanks so much for the feedback, Holly! Happy New Year! I just made these and it did not come out like the picture. The chocolate did not set to become fudge after being in my refrigerator for 6 hours. I am hoping it was EXTREMELY melted after being in the frig for 30mins after putting the caramel on. They look fabulous, but hope they will be ok for my holiday party tomorrow. It's an extra step, but you could coat the liners with a bit of melted chocolate to keep the caramel from sticking. Ok, epic failure for me. What did I do wrong. The caramel didn't stay attached to the chocolate. I put them in the mini cupcake with the liners and the caramel stuck to the liners! The chocolate was not a solid piece either, very soft, not like a piece of fudge. You could eat it if you wanted to eat it off the of the paper (which I did and they tasted great). What suggestions do you have for me? They looked great in the paper and would like to make them successfully next year. Thanks.Happy new Year. One way to keep them from sticking to the liners is to make the candys, then do like the professionals do and put them in the liners for serving or boxing after they have firmed.